Pat McCabe has confirmed his retirement from rugby, saying "it wasn't a particularly hard decision" after breaking his neck for the third time in less than two years. Scans on Tuesday confirmed that McCabe had fractured his C1 vertebrae again during the Bledisloe Cup Test against the All Blacks at Eden Park in Auckland on Saturday, and the Brumbies and Australia back on Wednesday confirmed ESPN's reports that he had been advised to retire, fearing another neck injury could have life-long consequences. "It's shattering thinking I'll never play for the Wallabies or the Brumbies again," McCabe told Fairfax Media. "I realise how fortunate I am. When I get out of the neck brace I will have no ongoing issues, I'll live a normal life. There are a hell of a lot of people who have it worse than me. Yes, I'm disappointed. But I'm lucky to be able to walk away from the game after three serious injuries intact. It's a blessing." McCabe said that he immediately knew something was wrong when he felt a sharp pain after a head knock against the All Blacks, describing the pain as similar to that he experienced he'd fractured his neck in 2012 and 2013. "I knew there was no real option other than to stop playing," McCabe said. "I've got a long life to live and while I am going to miss the game … it's just a matter of finding the next challenge and next goals to get excited about." Wallabies coach Ewen McKenzie congratulated McCabe on his impressive career, saying "Pat has made the right decision in putting his future health and well-being ahead of any desire he may have to continue playing rugby". "He is one of the smartest and most dedicated individuals I have had the pleasure of coaching and, irrespective of what avenue he chooses to go down, I have no doubt he will be a success. On the field, Pat made an amazing contribution to rugby at all levels of the game, and he'll finish his career with some wonderful memories and many great relationships that will remain with him for life. Pat is truly one of the good men of our game." 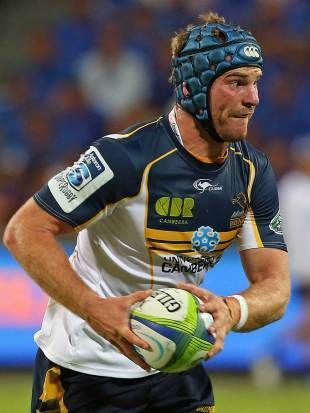 McCabe still has one year on his Brumbies contract and he will work with the club next season in an off-field role. But he will also return to his commerce law degree as he prepares for life after rugby.